The Bolognese is more than just another white, fluffy lap dog. These little dogs, originally from Italy, have a calm, affectionate demeanor, and they so love being around people that they’re prone to separation anxiety. The serene Bolognese dog can be a wonderful family pet but may not be suited to households with young children—with its small frame, this dog can easily become overwhelmed by bursts of affection from an enthusiastic child. The Bolognese might remind you of the Bichon Frise, and with good reason—they’re closely related and are sometimes called the Bichon Bolognese. They are also a cousin to the Maltese, Havanese, Coton de Tulear, and Lowchen. 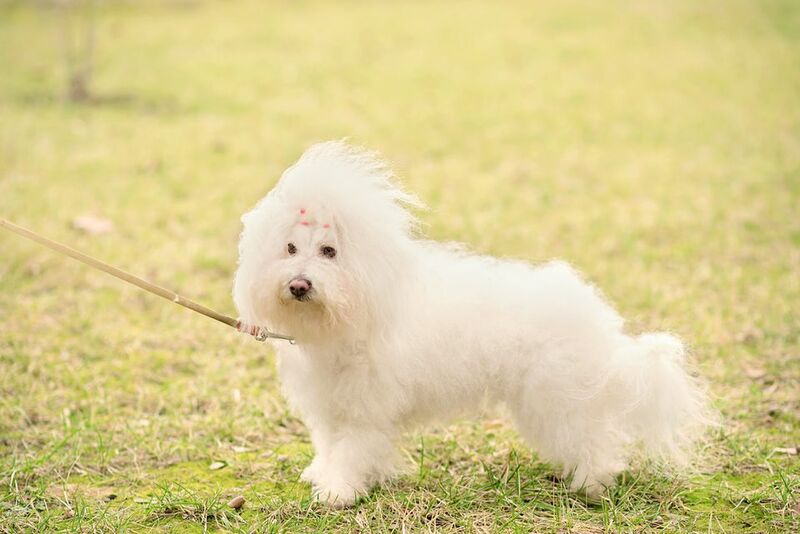 Descended from Bichons, the Bolognese dog originated in Bologna, Italy in the 11th century. The breed was loved by nobility and was a frequent gift between noble families during the Renaissance—particularly between Italian and Belgian royalty. When nobility started to die out, the breed almost went extinct. It wasn't until the 1980s that an Italian breeder named Gian Franco Giannelli, along with a few other European breeders helped to restore the Bolognese to its present-day popularity. The breed was brought into England and first shown in Imported Register classes in 1990. “Bolos,” as they’re affectionately called, are not yet accepted into the AKC, but have been showing at the Crufts dog show since 2002. Like all dogs, Bolos require some mental and physical exercise every day. They aren’t super-athletes and are generally satisfied with playtime in the backyard or long leashed walks. Because of their tendency toward separation anxiety, Bolos may not be suitable for people who work outside of the house 40 hours per week— owners should be sure to provide them with plenty of puzzle toys whenever they do have to be left home alone. They are usually quite friendly, though, and may thrive in doggie daycare that has a good setup for small dogs. The Bolognese requires significant grooming, just like all other long-haired dog breeds. If you’d rather clip the coat short, you won’t have to do as much brushing, but you’ll need to regularly trim your Bolo’s coat. If you elect to leave your Bolo’s coat long, expect to have to brush daily to avoid matting and smell. Like all dogs, Bolognese dogs require regular dental care and nail trims. Like many long-haired dogs, Bolos don’t shed profusely. They don’t lose their whole coat a few times a year like some breeds, such as Huskies. While they're often considered low-shedding, they do have hair so you may find long white hairs around your house. Still, for mild allergy sufferers or clean house lovers, a Bolognese might be a good fit. As a relatively rare breed without much commercial popularity, Bolos are also a healthy breed. Though their gene pool is small, it’s mostly maintained by very dedicated breeders. Before purchasing a Bolognese puppy, ask the breeder for proof of a patella exam and CERF (eye) exams at a minimum. It’s important to support good breeders who do extensive health testing for their puppies. Responsible breeding practices include more than just taking the parents and the puppies to the vet. Routine exams don’t necessarily catch many heritable genetic diseases that you want to avoid. Despite being less than athletic, Bolos still need good nutrition. In fact, a healthy diet is one of the best ways to keep your friendly little lap dog in good shape. Your vet will be able to help you pick out a small breed formula dog food. Be sure to regularly check your dog’s weight by feeling for her hipbones and ribcage. You should be able to palpate these bones without digging through any fat, but they should not stick out either. It can be hard to see your dog’s waistline through all that fluff, so be sure to use your hands! Puzzle feeders help slow your dog down during mealtimes and burn off energy, and can really help your dog enjoy his high-quality dog food. Finding a Bolognese rescue may be even more challenging, given that this breed so rarely turns up in shelters. You can register with The American Bolognese Club's Adoption, Rescue and Re-Homing Program, however, and they pledge to contact you if a dog becomes available. Is a Bolognese dog right for you? Before you bring home a new dog, you might want to explore some other similar breeds to compare their personalities and needs. Be sure to speak to owners, breeders, and rescue groups and meet a few Bolognese pups in person to learn more.